Solo: A Star Wars Story may not have taken off at the box office, but that doesn’t mean we’ve seen the last of the galaxy’s favorite nerf herder. Zen Studios announced that three Solo-inspired tables will be coming to Pinball FX3 on September 12, 2018. The Star Wars Pinball: Solo Pack lets you live out some of the movie’s most memorable moments, including the famous Kessel Run. You’ll even have the chance to step into the shoes of the smooth-talking Lando Calrissian. Star Wars Pinball: Solo – It’s the digital pinball table that—for the first time ever in a video game—makes the Kessel Run in less than 12 parsecs (if you round down). Exciting 3D character and vehicle models roar to life as you relive all your favorite movie scenes from Solo: A Star Wars Story, from the grand Conveyex shipment heist, the speeder chase and piloting the Millennium Falcon, to meeting familiar faces like Lando Calrissian and Chewbacca. Star Wars Pinball: Battle of Mimban – For the glory of the Empire! Deploy an Imperial army and lead it to victory against the fierce inhabitants of the planet Mimban. There will be no deserters in this rendition of the battle brought to life in Solo: A Star Wars Story where Han Solo met Beckett. And if there are? Feed them to “the beast” in the pit! Then, unleash devastating AT-DT attacks, take on enemy troops on an action-packed mini playfield, dirty things up further with a Mudball Multi-ball and more. 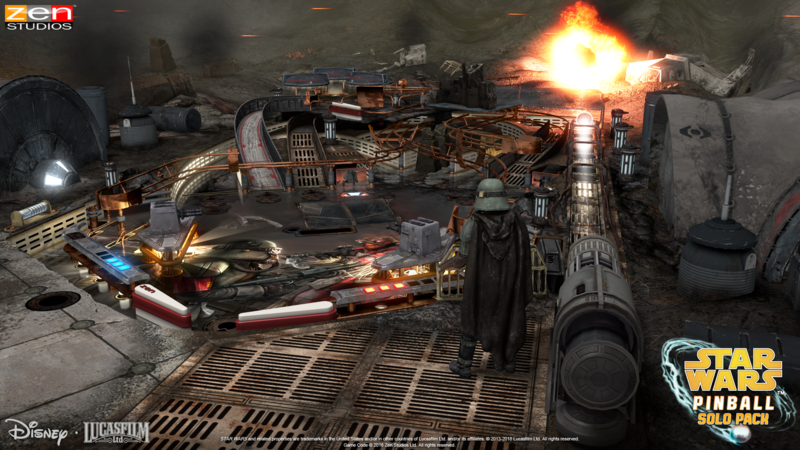 Star Wars Pinball: Solo Pack joins Jurassic Park as one of the many properties featured in Pinball FX3. The add-on will be available on September 12, 2018, for the PlayStation 4, Xbox One, and PC.